Let’s start the holiday season off with a bang! 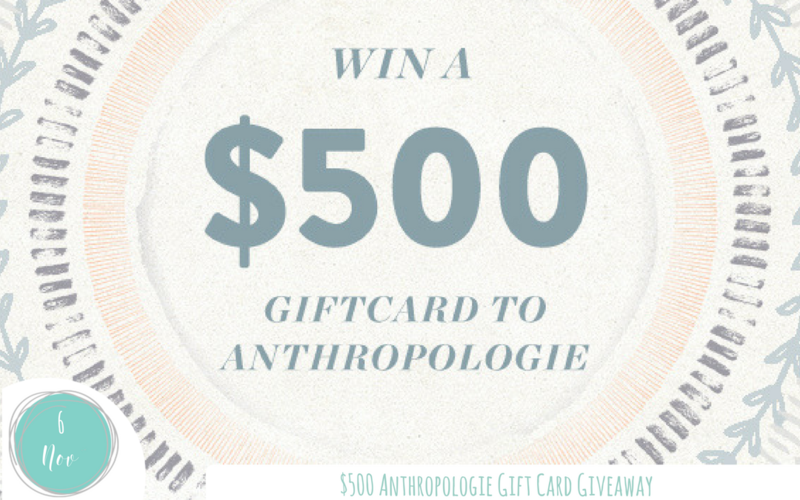 A $500 Anthropologie Gift Card Giveaway! Seriously Amazing Anthropologie Shopping Spree Giveaway! Who else here loves the holiday season?! Can I hear a big me, me, me! I am already getting out my decorations and sprinkling the house with a little sparkle. To celebrate the season, I’ve teamed up with some of my favorite hostesses (I love these ladies!) to give one lucky person a $500 Anthropologie Gift Card to make your holiday amazing!! I’m currently obsessing over the new range of table & barware over at Anthropologie. What would I get if I won a shopping spree at Anthropologie? My top 3 picks for celebrating this season would be these Agate Cheeseboards, they are stunning for a cocktail get together. As is this glamorous Moonglow Cocktail Shaker. I’m seeing fabulous hostess gift right here! Lastly, I’m dying over these animal place card holders. What a cute welcome to the dinnertable for Thanksgiving! Treat yourself to some of your favorite things and enter to win a $500 gift card. YAY!!! This giveaway is being hosted on Instagram and entering is super easy!!! If going on a $500 Anthropologie shopping spree is something you’d like to win, here are are the two steps that you need to do. FYI: Each individual comment counts as an entry, and entries are unlimited! WOHOOOO!!!! FOLLOW all of my friends, the amazing hostesses who helped me put this giveaway together AND like their last 3 posts. **You must do this step because we will verify the winner is following all accounts. You do not need to comment on every person’s feed, just mine is fine! This giveaway will run through Sunday night 11/12/17 at 10pm MDT, and the winner will be announced on my Instagram Giveaway Post on the evening of Monday, November 13th. Be sure to Follow me on Instagram, so you will know if you won or not. RULES: You must be 18 years of age or older to enter. Instagram and Anthropologie are in no way liable or responsible for this giveaway.